Photoshop: Actions Will Not Record "Option+Click"
I have been trying to create an action that involves making a layer mask and then directly editing that layer mask using the "option+click" command, but for some reason this command will not be recorded in the action! So frustrating! I have tried numerous, numerous times! This needs to be fixed! Did this ever work in a version of Photoshop for you? This seems to be working for me. 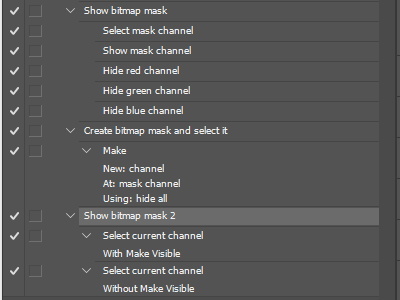 If I create the mask, then Opt + Click the mask it creates a step called "Select Mask Channel" with sub-detail "With make visible"
Thanks for your response, Jeffrey. No this has never worked for me - a few weeks ago is the first time I've tried as I've never used actions to record this type of workflow before. I'm not talking about just selecting the mask as you mention, but directly editing it so that I can paste into it. If you Opt+Click multiple times back and forth repeatedly the actions panel doesn't record this for you, correct? The action panel records /selecting/ the mask for me, but not going in and directly editing it. For example, I'm attempting to directly edit the layer mask by pasting an inverted image as the mask on a colored rectangle to make a single colored image. When I play back the action on another file it makes a separate layer instead of making the inverted image the layer mask itself, as I had originally done. Do you see what I mean? As workaround you can set all channels separately see my first action. Do you have Photoshop CC 2015.5 ?